After arrest of Rubel Alias Pradip Chetia, this time a press release has been sent by Paresh Barauh himself. In a press release sent to the media via email, today ULFA Commander-in-Chief Colonel Paresh Barauh declared that there would be no compromise on the issue of Sovereignty and appealed to the people not to be misguided by rumors spread by fraudulent sources. He also suggested that he and the entire outfit is always ready for any dialogue with the Government of India, if the negotiations include sovereignty as the agenda, claiming that this would reflect the hopes and aspirations of the people of Assam. He also declared all the senior brass of leaders of the outfit are aware of the aims and directions of the Outfit, and appealed to the other senior freed leaders not to initiate talks just for the sake of holding talks. However the highlight of this press release was that Baruah has claimed that his son has been kidnapped by enemies to impose pressure on him for his surrender. However he has declared that he would not bow down to his enemies and that his love and grit for his motherland was much more than his personal emotions. 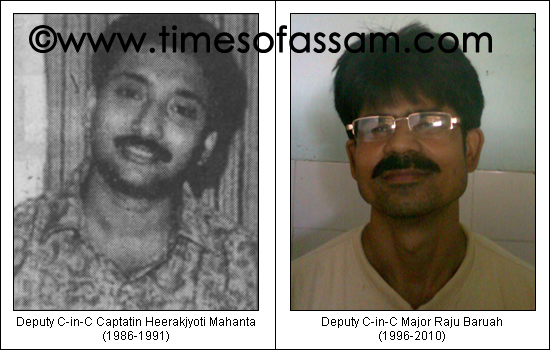 From the press release, it can be observed that the rift in the top brass seems evident and ULFA, reminding the common people of the days of 1991 when the first Peace Dialogue between Government of India and ULFA has unsuccessfully done. During those set of discussions held in Delhi, the Government was successful in bringing about the first successful rift in the organization, with many top leaders of those era including the then Foreign Secretary Kalpajyotii Neog, Publicity Secretary Sunil Nath alias Siddhartha Phukan, Munin Nabish, Jugal Kishor Mahanta alias Pahar (who rejoined ULFA by his escape with jail break even after he was captured by Army in armed operation), Manoj Hazarika etc after the mysterious killing of the then Deptuy C-in-C of the outfit Captain Heerak Jyoti Mahanta on Tuesday, December 31, 1991. In that period the General Secretary of ULFA Anup Chetia alias Golap Baruah was able to manage the situation manipulated by the Government of India by his diplomatic strategy. That time the outfit had back-up for their armed wing including skilled guerilla and socially reputed leaders like Raju Barua, Tapan Barua, Bastav Deodhai Phukan, Monpa Rongpi, Madhurya Gohain, Pabitra Jamidar, Prabhat Saikia and several, but the same is not there for the outfit this time.